Jack Francis’ whimsical kiddie trolly is clanging along to the tune of merry dollars. Optimistic as he is, even Francis thought his idea for a kids’ trolly was a bit zany. While he rode around on his motorcycle, doing his job as a traffic officer for the city of Oakland, Calif., he kept thinking about building a little trolly car. In his work with traffic safety, Francis had plenty of experience with youngsters. He loves children and, with the trolly car scheme he had in mind, he thought he had something that would make them happy. 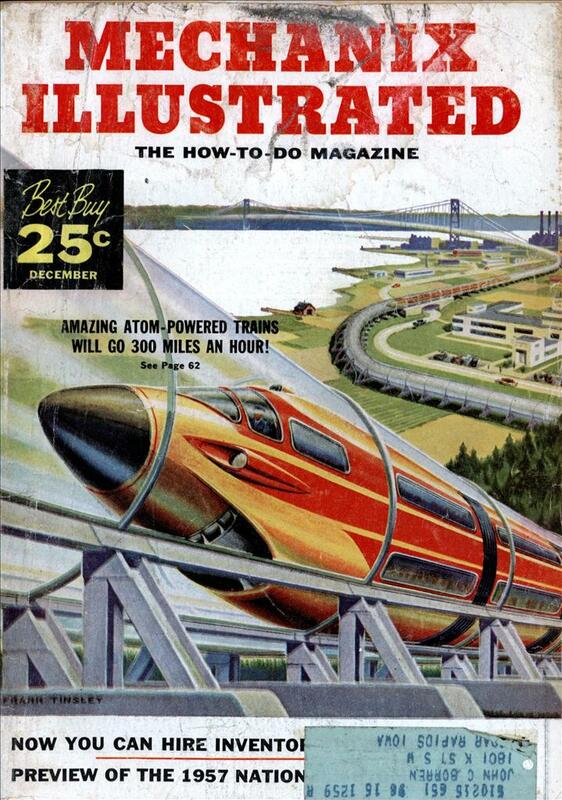 But he had three problems: no money to build it, no place to operate it, and no time to undertake such a project. Among his friends who took a special interest in Francis’ idea was his fellow traffic officer Sam Daugherty. While this duo made their motorcycle rounds they discussed how the dream trolly might look. Sam, who is skilled with a drawing pencil, went home one night and drew up a series of rough diagrams and sketches. That was the spark that ignited the flame in Francis. Armed with the gay drawings, he approached Superintendent William Penn Mott of the Oakland Park Department with the idea of building such a trolly and operating it in Oakland^ nationally famous Children’s Fairyland. Mott and his board members agreed that if the finished project was as imaginative and clever as the sketches, Francis could have park space for his project. Although he had no firm commitment from the parks (they wanted to see what they were getting) Francis was encouraged enough to approach a bank. Now, quaint little trolly cars operating on a seasonal basis are not usually considered collateral but the civic-minded Oakland Bank of Commerce decided to back Francis in his venture. Thus Francis began work on a model, building it with police buddy Daugherty’s help in his own garage workshop on weekends and evenings. The result was a sturdy little car with plenty of personality. The body is 11- gauge steel framing, all hand-riveted. The wood top is antiqued pine, with quaint, old-fashioned windows for the youngsters to peek through. The first car was painted a bright turquoise. Later Francis added one of coral, another of bright blue and a gay yellow. The model (and later ones) measures 42 inches in width, 80 inches in length and 89 inches in height. The interior has leather straps hung at just the right height for youngsters; the seats are of attractive and durable rattan. When the model was complete, Francis devised a plan for a rustic setting with old-fashioned light posts, lanterns and a 12xl8-ft. depot and platform. He hung bright baskets of geraniums and put old-fashioned dummies, a pot-bellied stove and a wall telephone to give a Gay ’90s atmosphere to the station. The bank directors and park officers were enthusiastic with the whimsical model car and the plan for its setting. So with the park’s guarantee of a spot in Fairyland, and with an initial loan of $8,000 from the bank, Francis began building the conductor’s car and four identical passenger cars. He then gave notice to the police department so that he could give full-time to his jolly trolly. Aided by his friend, Sam Daugherty, Francis laid 3,100 feet of 12-pound, 21-1/2-inch gauge track and built the charming, old-fashioned depot. The Jolly Trolly began operating in August, 1955 and the small fry have been clamouring for rides ever since. The conductor wears a high collar and striped shirt in the style of the ’90s. He takes the youngsters for a bumpy, six-minute ride amidst the oaks and pines— in view of Oakland’s skyline and along the edge of beautiful Lake Merritt. It’s a scenic trip as well as a gay one. The kids pile in, eight to a car, and pay ten cents a ride. Francis hauls about 2,000 children along his happy route, from 10:30 a. m. to 5 p. m. each day. As a result, he has built a business that today represents an investment of $26,000. The project is now set up under the firm name of Jolly Trolly Enterprises. The bank first arranged a chattel mortgage and they have written a con- tract which allows for payments on a seasonal basis. From time-to-time, they have loaned as much as $15,000 to the project. The little trolly carries as many as 35,000 passengers in its peak month although bad weather sometimes knocks this figure down to 5,000. Francis’ trolly operates nine-and-one-half months a year. Francis says he will never forget his sense of elation when the bank said “yes” to his unique idea for this miniature gas-powered ride for small fry. 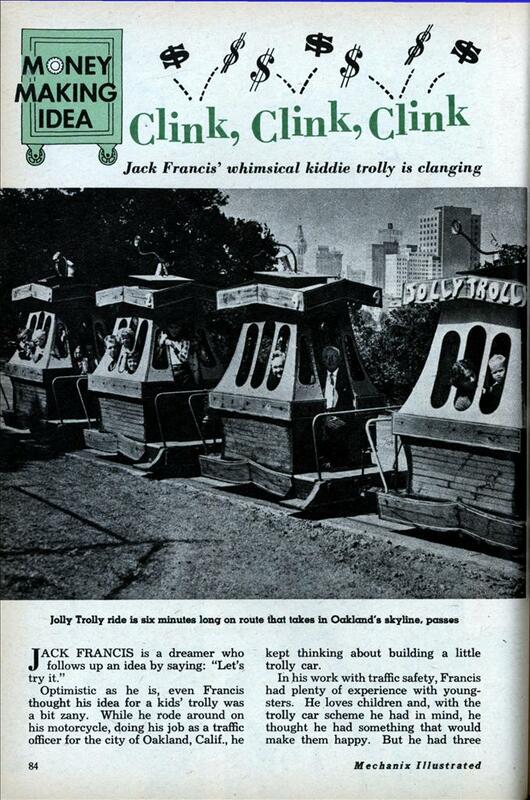 In fact, he ended up packing so much whimsy and charm in his colorful creation that even the parents of the youngsters who ride his train became enchanted with the Jolly Trolly, making it one of the major attractions in Oakland’s Children’s Fairyland. Francis, who left a secure job with eight-and-one-half years’ seniority on the police force now has a brand-new patent, issued in August 1956, on his appealing trolly. He’s already expanding his business to accommodate the daily horde of fun-lovers that crowd the ticket office. He must add new cars to carry the load and has built a new mechanical set-up, using a 36-horsepower Volkswagen auto engine. The unit also includes a Nixe marine transmission—with forward, neutral, and reverse for train-type operation—gas tank and electric self-starter. I see the Jolly Trolley is still up and running in Oakland. The Children’s Fairyland web site says it’s the oldest operating ride at the park. Does it still use an aircooled VW engine? Talk about an unmistakable sound! I think somebody copied the Toonerville trolley.